I surround myself with “Unapologetically” strong women. Always. As I was thinking about this post, I realized that I have always been drawn to strong women. I think this is because I grew up with a strong mother. And my Mom instilled in me the same inner strength. By the way, my Mom is the strongest woman I know. There have been times when I doubted my strength. But as I’ve gotten older, I don’t doubt myself anymore. I AM strong, and make no apologies for it. Lucky for my husband, one of the things he found attractive was my inner strength. I remember him telling me that many years ago when we were first together. My biggest unapologetically strong moment was when I decided to have my son. I had spent most of my 38 years thinking I never, ever, wanted children. There was some genetic issues in my family that I did not want to take a chance on passing onto a child. However, my husband and I knew that we had so much love to give, and that no matter what a child of ours would be like, we knew we would love him or her. And love we do! All my fears just went to the wayside, and I had the strength I really never knew I had. We were blessed with a healthy boy. The campaign kicks off on Wednesday, September 12th with a contest hosted on the Degree Women® Facebook page, inviting women to share their own unique and inspiring Unapologetically Strong stories and goals. By sharing their own stories of their own personal challenges, fans will be entered for a chance to win giveaways from Degree Women® to help on their Unapologetically Strong journey. One winner will also have the opportunity to win the grand prize of $5,000 to spend on achieving their goal. 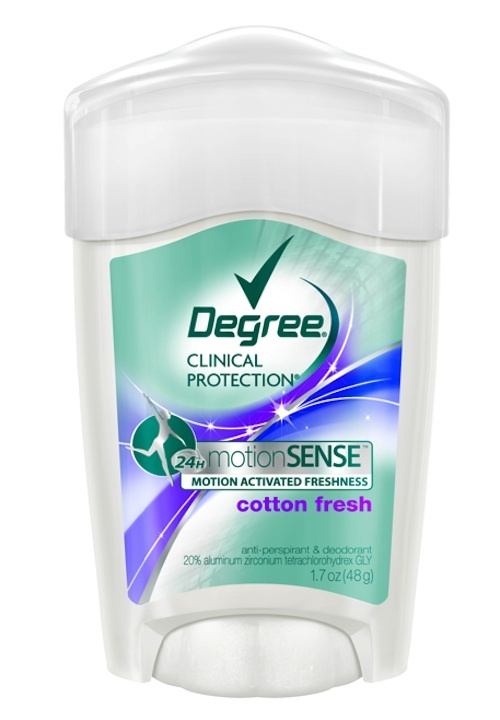 I’m looking forward to trying the Degree Women® Clinical Protection with motionSENSE™ in NEW Cotton Fresh. I am sure I’ll feel even stronger, knowing I have more protection. Disclosure: I participated in this campaign as a member of One2One Network, I received product, and am eligible for a prize drawing. All opinions are 100% my own, and may differ from yours. 5 Responses to What’s Your Degree Women Unapologetically Strong Story? My mom would definitely be on top of my list of strong women too! She’s the best! My girlfriend is also a strong women, i myself thought i would never be married or have kids. I have been married twice and have 6 biological children and two step boys. But my girlfriends mother just passed and she is holding it together pretty well i help her along the way. She deserves to know she is worth it. @Scott, yes she does! And it sounds like you’re a great boyfriend by recognizing her strengths. I’m sure you let her know she is worth it! What a wonderful contest to recognize the strongest women among us! I know so many that selecting a story to share won’t be easy.